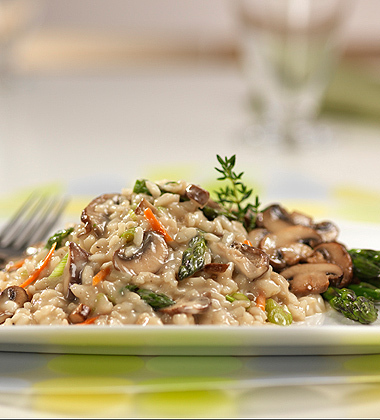 Try our delicious Mushroom Asparagus Risotto made with Campbell's® Condensed Cream of Mushroom Soup and Swanson® Natural Goodness® Chicken Broth. 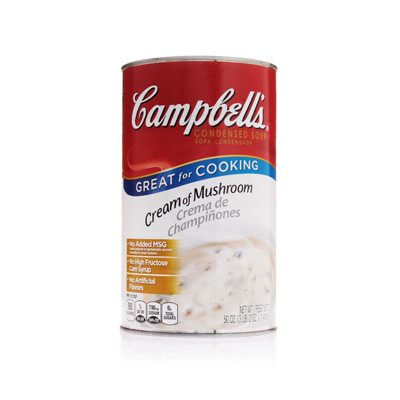 Garnished with fresh thyme and parmesan cheese for a creamy, rich flavor everyone will love. 1. Heat oil in large rondo or covered skillet over medium-high heat; add onions and sauté 4 minutes. Stir in garlic and sauté until translucent, about 2 minutes. Add asparagus and mushrooms and sauté for 5 minutes.Stir in thyme. long grain white rice, unprepared	 26 oz. 1 1/2 qt. 2. Add rice. Continue to sauté for 2 minutes. Stir in carrots and scallions. 3. 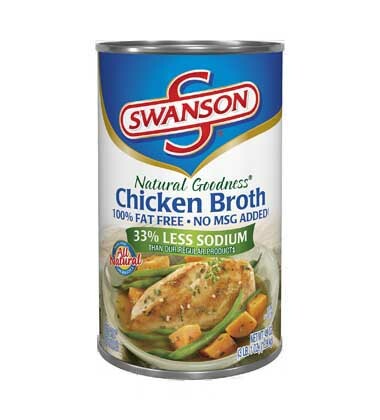 Add soup and broth and bring to a boil. Reduce to very low heat; cover and cook for 25 minutes or until liquid is absorbed and rice is tender. Cook to an internal temperature of 165°F. or higher for 15 seconds. Remove from heat and let rest 10 minutes before serving. 4. Stir in cheese until melted. Serve immediately. CCP: Serve hot at 140°F or higher, or chill to 40°F or lower to hold. fresh thyme leaves, sprigs	 24 ea. 5. To Serve: Spoon 1-1/2 cups risotto into a hot soup plate or bowl. Garnish with 1 Tbsp. grated parmesan cheese and fresh thyme sprig. long grain white rice	 26 oz. 1 1/2 qt. fresh thyme leaves	 24 ea.